Grown too much silverbeet and don't want to waste it? Loaded with parsley seeds but really need a pumpkin? Stuck with surplus worm juice and need more thyme (who doesn't)? Cookbooks taking over your kitchen? Got an extra garden fork? You can solve all these problems at a food swap. Swappers deposit their stuff and then ‘shop’ from the table of stuff left by others. What you pick up should be a fair reflection of what you have put down. No money changes hands. There are food swaps happening everywhere all the time and they have been around forever when you think about it. It just works! At our next Garden & Gather (from 11am on 28th Sept) we're relaunching our food swap at the West Brunswick Community Garden then we'll hold one every month on the 4th Sunday. Everyone (not just people connected with our garden) can come along and exchange things like fruit, vegetables, herbs, eggs, seeds, honey, preserves, tools, seedlings, cookbooks, fruit trees, compost or worm juice, but don't let this list limit you, be imaginative. Community garden or home grown, it doesn't matter. Why are we doing this? 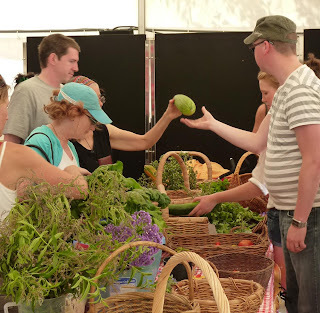 To have a bit of fun, share delicious local food, create friendships, build a stronger community, reduce waste and encourage a grass roots response to food access issues in Moreland and beyond. Foods swaps are popping up all over Melbourne, in community gardens, local parks, meeting places and even beside traditional markets. Every weekend you can visit a Food Swap in Moreland and from Fawkner to Footscray, Cockatoo to Coburg, Food Swaps are sprouting up all over Victoria.